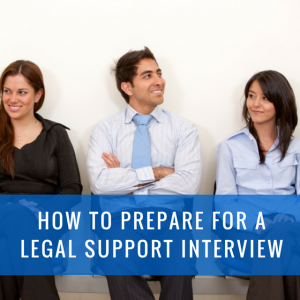 When preparing for legal support interviews, many key factors contribute to success. In preparation, many questions must be asked. What will you wear? Are you nervous? Are you smiling enough or too much? These are all important questions, but obviously interviewing for a legal support position involves much more than just appearances. In the chaotic, often stressful legal world, prospective employers are all looking for support staff that withstand the pace and demand. Here’s what they are looking for. You must be able to articulate your skill set. Everyone interviewing for a position will share many skills and experiences, but what challenging experiences and skills set you apart? Do you excel in a high stress environment? Be prepared to explain an ultra-high stress evaluation you have dealt with. Do you specialize in excessive file loads from multiple Lawyers all while staying calm and efficient? What are the specifics of these excessive file loads? You must be prepared to give examples of how you handled a high stress situation. How many trials did you assist with last year, and what skills and experiences did you gain from assisting those trials? Did you meet deadlines that were given to you? Sometimes, even with advanced multi-tasking abilities, a deadline can be missed. Did you meet and exceed deadline exceptions? Employers also want to get a sense of how you will get along with your co-workers and managers. In the fast pace, high stress legal environment there must be certain “challenging” personalities that have crossed your path? How did you deal with these? Even the nicest lawyer can lose their cool! Law firms want to know that a candidate for a position is looking for a “long term” role. Why did you leave your last role? If hired, what will be done differently to ensure a long-term career with the new employer The ability to express long-term career aspirations is pinnacle to your success in gaining a legal support staff position. Anyone can discuss their abilities and attributes, but detailed examples of how you succeeded with deadlines, stress, goals, multi-tasking, and challenging personalities will set you apart as a rarity in a competitive workforce.